The band is made up of four very experienced musicians and normally comprises trumpet, string bass, clarinet and banjo/guitar. If required we can provide additional musicians for a larger band. Also we can add a young lady singer. (See Helen's video - left). (Helen is originally from Hull but is fluent in Spanish and French). Our banjo player can play guitar and our clarinet player can play tenor saxophone. We provide music for pubs,clubs, parties, corporate events and weddings - and for outside events such as barbecues and bandstands in public parks. (We have even played at funerals). We play tuneful, foot tapping melodies and we are not too loud - conversation is still possible! You can dance to our music and we are popular with all ages (even very young children!). We are based in the Stamford area UK and we will travel around 60 miles. We are so grateful to the Stamford Stompers + Helen for another great evening. Everyone loves your happy brand of music. It helped to make a real fun occasion. These guys were absolutely amazing. We had them at our wedding in the afternoon, they made our wedding even more special and set the tone to be a very classy garden party. They were lovely and played great tunes and really made our day and our wedding; would recommend and then recommend again. Even played Disney. Michelle's Birthday Party - excellent jazz band, very classy, perfect for the event in question. It's nice to see a band which does things so simply and professionally, providing a full sound with the minimum of equipment. They were happy to play to the room when people were eating and talking, at a volume which still allowed conversation, but were friendly and engaging as and when people wanted to interact with them. The singer they provide (if required) has a great voice, well matched to their style, no over-acting or dramatic self indulgence, just confident, strong and pitch perfect. Great day, thank you. ...booking your group really was the icing on the cake for my party! Everyone commented how wonderful you were and the tone you set for us was just right. We have your business card and please use these comments to promote The Stamford Stompers. and Helen was absolutely superb … her singing was top class and great to listen to. We cannot thank you enough for a very enjoyable evening. You were a blast – thank you kindly! Everyone loved you but most especially did my old Pa: that makes me very happy. I would just like to say again thank you to you and the rest of the band for being part of our lovely wedding day. Your music really set the tone for all of us to have a fun day ... our guests thought your music was really great. I have attached a photo ... of the band at Normanton Church. 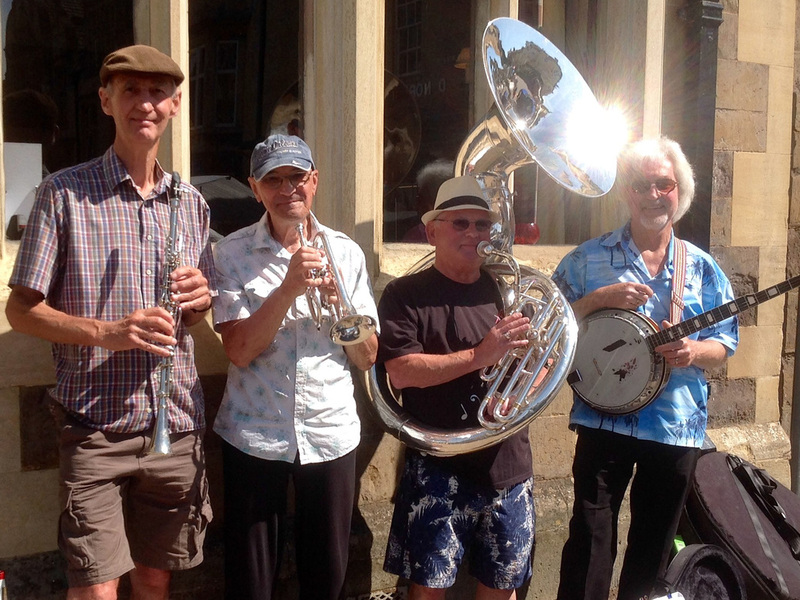 Photo below shows the band busking at Uppingham - summer 2015. Just a belated note to tell you how delighted we were by your playing at my party in Elton on the 6th September. We got glowing praise from our guests - and also from various neighbours who sat in their own gardens, with a drink, to enjoy your music! Thanks again. Thank you for playing. The music made all the difference!